Cans. They are literally crushable — especially in the summer. A cold can of beer is the perfect complement to outdoor-loving cooks, campers, sporting-types and general explorers. And while some may contend that Northeastern Ohio has very little enjoyable weather to explore (most recently noted by close friends visiting CBB’s Strongsville, Ohio, satellite office), summers in Cleveland (right next to Lake Erie) are actually perfect for outdoor adventures with a few brewskis. Just in time for said summer season, Great Lakes Brewing Co. is launching a few of its beers in can packaging for the first time, and it’s doing it through a cool partnership. Great Lakes has been in the process of expanding its home base in Cleveland for some time, making moves since 2013 to upgrade its brewhouse automation, labeler, tank farm and water deaeration. It spent $7 million in upgrades — especially on brewery tanks (check out that story here). But that expansion did not include a canning line. Instead, Great Lakes is taking it slow, establishing an interim partnership with Harpoon Brewery, which will be producing and packaging three Great Lakes canned brands at Harpoon’s facility in Boston. Beginning in May 2017, year-round Turntable Pils and seasonal Lightkeeper Blonde Ale will be available in 12-ounce can 12-packs. Former pub exclusive Rally Drum Red Ale will be available in 16-ounce can 12-packs. Turntable Pils 16-ounce can 12-packs will follow in August 2017. Each package features artwork by award-winning illustrator Darren Booth and represents stories and figures from the Great Lakes region. Tell us about these beers already! Turntable Pils, a classic Czech-style Pilsner named in honor of Ohio’s music legacy, made its seasonal debut in April of 2016. 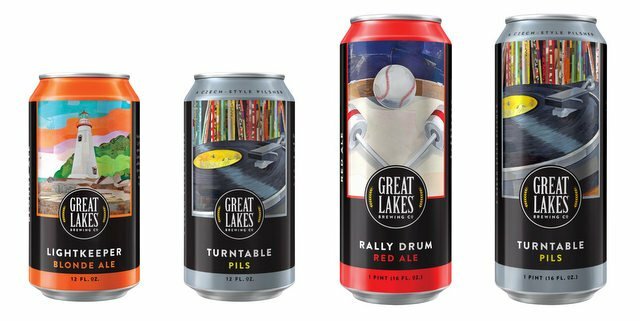 In 2017 Turntable Pils joined favorites like Dortmunder Gold Lager and Edmund Fitzgerald Porter as GLBC’s sixth year-round offering and earned a Silver Medal from the Beverage Testing Institute. Lightkeeper Blonde Ale made its debut in GLBC’s Fridge Filler Variety Pack in Mar. 2017. A refreshing Blonde Ale guided by light malt and dry, fruity hop flavors, Lightkeeper Blonde Ale’s label features Lake Erie’s iconic Marblehead Lighthouse. Rally Drum Red Ale is a longtime GLBC brewpub favorite inspired by infamous Cleveland baseball fan and bleacher percussionist John J. Adams. The label artwork features a painting of his iconic drum and mallets, and the beer fields a double header of bitter hop and roasted malt flavors.